Larry D. Thompson is a veteran trial lawyer and has drawn on decades of experience in the courtroom to produce riveting legal thrillers. Dead Peasants is is third After graduating from the University of Texas School of Law, Thompson founded the Houston trial firm where he still serves as managing partner. The proud father of three grown children, he lives and works in Texas but spends his summers in Colorado, where he crafts his novels and hikes the mountains surrounding Vail. His greatest inspiration came from Thomas Thompson, his brother, who wrote many best-selling true-crime books and novels. Originally, it was a way of passing on history. Now I believe it is a means of entertainment and diversion from our mundane day-to-day lives. I wrote my first novel when I was sixty. Fortunately, I come from long-lived stock; so, I still hve fifteen or twenty novels left in me. From the past, I’ll take Tom Sawyer. In more current times I’m partial to Blood and Money, a true crime story written by my brother, Thomas Thompson, thirty years ago. I was just smart enough to do about anything I wanted, short of professions involving math. Never give up. Keep writing until someone recognizes your talent. Can you tell us when you started Dead Peasants: A Thriller, how that came about? I am always on the lookout for stories. I read an article in the Houston Chronicle about a woman whose young husband died. She was accidently sent proceeds of four million dollars from a life insurance policy, payable to his employer. Neither he nor she knew anything about it. It struck a chord and lead to Dead Peasants, which, by the way, is the name for a policy written on an employee by an employer who never tells the employee. Tod Duncan from So Help Me God would like to meet the Clarence Darrow character from Inherit the Wind. For those who are unfamiliar with Jack, how would you introduce him? He’s a small town boy from Fort Worth who has a chip on his shoulder because he came from the poor side of the tracks. After he becomes wealthy as a plaintiff lawyer in Beaumont, Texas, he retires to Fort Worth where he becomes a pro bono lawyer, helping people who cannot afford a lawyer and finds himself having to solve a series of serial killings before his love interest also becomes a victim. Never quit, in life and in writing. Not that I’m always honest (Who is? ), but I can’t think of one particular question. I love the mountains of Colorado in the summer. I was a park ranger in Sequoia National Park between my second and third years of law school. If there had been more money in it, I would have loved to be a park ranger as a career. Today. My wife and I tell each other that many times a day (and it’s true). Neither. If I love someone, I say so and tell them that in return. That group, by the way, is limited to my wife, my kids and grandkids. I don’t cry a lot, but I get choked up pretty easily, even with an emotional scene in a movie. I like when I grew up, in the late fifties and early sixties. Retiring from winning a huge case and having a very successful career as a plaintiff attorney, Jack Bryant couldn’t wait to ease his mind and move back to Forth Worth to relax and watch his son play football for TCU. Although he is very wealthy and has become very close friends with the beautiful Colby Stripling, he quickly becomes bored with his new life and decides to open his own legal practice. At first, things seemed bright but just as quick as his retirement announcement; it all goes downhill when he takes an insurance case from June Davis. 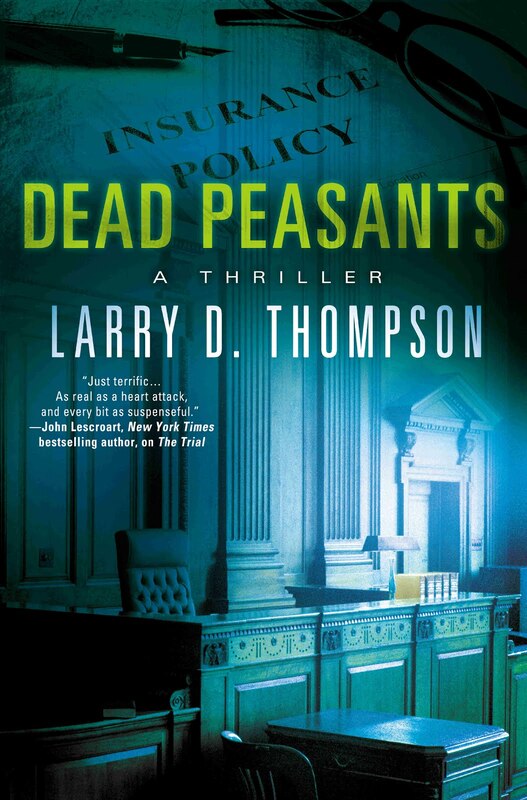 Larry D. Thompson’s Dead Peasants is the suspenseful tale of a man that finds himself in a whirlwind of bad news that will leave readers surprised and astonished. Readers will be captivated right from the start through Larry’s incredible writing. The fact that he is a lawyer himself gives credibility and authenticity to Jack Bryant and this riveting adventure he’s put himself into. The boring retirement life that he thought he was living is suddenly turned upside-down. His retirement location of Fort Worth is described in such great detail that I felt I was in that environment. Larry’s writing style manages to place readers into Jack’s shoes and get a firsthand experience towards his desires. The characters in this gripping story are incredibly created and push the story along quite well. Whether the setting is on the streets, in the courtroom or even in Jack’s RV office, readers can easily picture themselves alongside these vibrant characters. The details that Larry puts into every aspect of this book are immensely filled with thrill and suspense. Larry’s occupation as a lawyer provided authentic courtroom drama. There are plenty of story developments to keep readers on the edge of their seats without the unnecessary fillers. It has murder and mystery that will continuously maintain interest levels at high peaks. Dead Peasants is a well written book with memorable characters and a plot that moves along quickly and smoothly. Thank you Larry for making this giveaway possible. 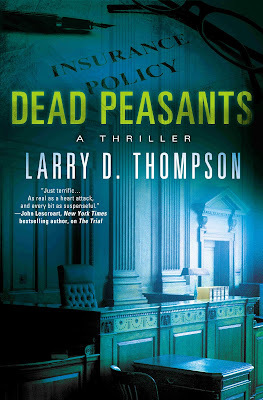 1 Winner will receive a Copy of Dead Peasants by Larry D. Thompson. Thank you Jean for another awesome giveaway!! This book sounds so good and I am so looking forward to reading this one!! 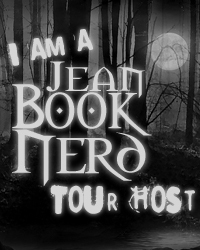 Thanks for your thoughts, Jean! This book looks great! I can't wait to read it. Thanks!